12 www.coalage.com January/February 2019 u.s. news continued c o m m e n t a r y to share our success with the Nava- jo Nation," said Moseley. "We have stated that purchasing Navajo mine was a good investment for the Navajo Nation, and now the nation is experi- encing the benefit revenues generat- ing from coal sales. The distribution is in addition to the nearly $40 million in taxes and royalties we have paid the Navajo Nation in 2018. We are proud to share our success with the Navajo Nation." Blaschak Coal Sets Sales Record in 2018 Blaschak Coal Corp., one of the coun- try's top anthracite producers, has achieved record sales tonnage for 2018. The company's prepared coal sales were more than 382,000 tons in 2018 — up from the previous sales record set in 2014, which clocked in at 374,000. The primary drivers behind the sales growth were increased demand from metallurgical process indus- tries, the home heating sector and the food services market — namely coal- fired pizza, according to Blaschak. "We are more than thrilled with the record sales numbers we achieved this past year," said Greg Driscoll, president and CEO of Blaschak Coal Corp. "While we've seen demand in traditional mar- kets driving current sales levels, the continued interest in the presence of Rare Earth Elements (REE) in anthra- cite and other related materials, and the potential for growth in other carbon-re- lated markets, which has fostered a number of new projects, are also posi- tive signs for the future of anthracite. "At Blaschak, we are encouraged by this record, and see it as a sign of continued growth for us and the lo- cal industry," he added. "There is a significant remaining reserve of this valuable resource." Driscoll believes the Pennsylvania anthracite industry will continue to serve existing markets, and that new markets are emerging. "Even though record regional rain- fall provided challenges to mining ac- tivities across the industry in 2018, in- creased demand for our high-quality anthracite products drove strong over- all performance," Driscoll added. "We remain committed to being a leader in safe and responsible operating prac- tices while increasing capacity, pro- viding excellent customer service and exploring new market applications." Yesterday's MSHA Withholds Today's Technology From Miners by bruce watzman What does it take to drive further improve- ments in mine safety and health to reduce fatalities, injuries and illnesses? Does it take more than accepting the status quo as being the proper course to attain these im- provements? Of course, it does. Does it take engaging all stakeholders to clearly identify the barriers to im- provement and the steps required to overcome them? Of course, it does. Unfortunately, neither of these seem to be occurring within the Mine Safety and Health Administration (MSHA). Throughout its history, MSHA has been driven largely by one metric — the number of fatalities occurring annually across the industry. This almost singular goal, while laudable, ignores the structural changes that have, and continue, to take place across the industry to improve safety. In doing so, mine operators, and more importantly, miners have been denied protections otherwise available if not for the agency's resistance to change. How many people in the industry believe that seat belts and alarms, technologies already commercially available, are what's needed to continue the long-term reduction in fatalities? We grieve with those who lost loved ones where these technologies may have prevented a fatality, but they alone are not the answer. Today, safety professionals face many challenges, and tech- nology must be a part of the solution, but fewer and fewer technology providers are bringing new products to market due to the agency's antiquated approval and certification (A&C) process. All applauded the new assistant secretary who, early in his tenure, spoke to the role of technology to drive safety improvement, but what has been done to overcome the structural barriers in the approval and certifi- cation process? It is overdue for MSHA to recognize approvals issued by recognized international approval organizations. MSHA's obsolete A&C process for equipment and technology must be updated to reflect the structural changes under way in the industry so that the policies, procedures and practices that best protect miners can be fully realized. 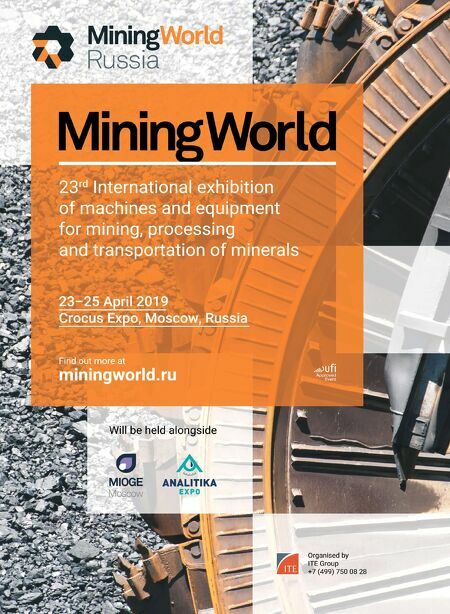 At the district and head- quarters level, the agency must update its mine plan approval process to provide for the timely consideration and approval of plans necessary to introduce and implement new safety technolo- gy and operational measures that best protect miners. Miners and mine operators need a willing partner to drive the next breakthrough in safety improvement. Is today's MSHA that partner? I leave that for you to decide. I believe improvements will occur when all parties are willing to have an open and honest discussion about the barriers that exist. MSHA can facilitate the change we all want, continue the progress that has been made in reducing fatalities and improve safety. But, it will require leader- ship and self-reflection to shake up the status quo. 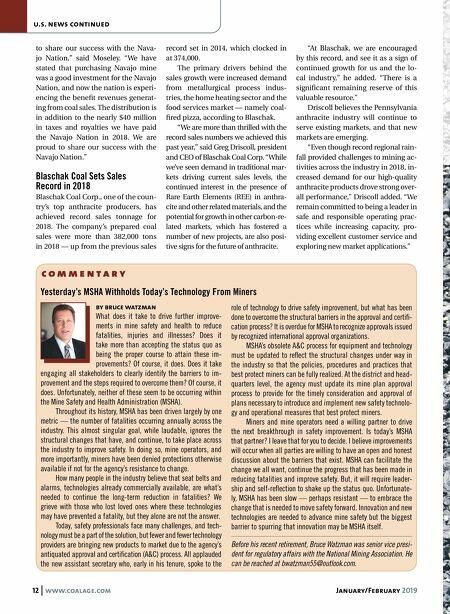 Unfortunate- ly, MSHA has been slow — perhaps resistant — to embrace the change that is needed to move safety forward. Innovation and new technologies are needed to advance mine safety but the biggest barrier to spurring that innovation may be MSHA itself. Before his recent retirement, Bruce Watzman was senior vice presi- dent for regulatory affairs with the National Mining Association. He can be reached at bwatzman55@outlook.com.